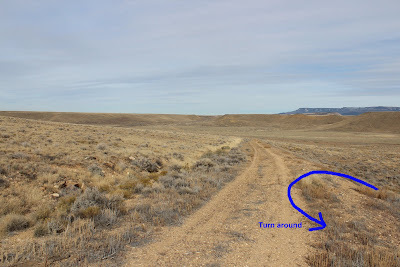 This post covers the Fool's Hill section of the historic Salt Lake Wagon Road. This route was used between 1875 and 1891 by freight wagons to carry government rations to the Ute Indians near Montrose, Colorado. Antoine Robidoux also made use of the road to ferry supplies between Fort Uncompaghre, in Delta, Colorado, to Green River, Utah. Through ancient times archaic inhabitants have followed common trails as they migrated from place to place and engaged in commerce with each other. The Ute Indians had a system of trails many of which surely followed the same routes as the people that came before them. When the Spanish and later the trappers arrived on the scene they too made use of the current trails for their main routes. This section of the Salt Lake Wagon Road is thought to have followed in part the North Branch of the Old Spanish Trail which in turn followed portions of old Ute trails. When motor vehicles first arrived in the area they had no other roads to use besides those that were already being used by wagons. Army Captain John Gunnison was apparently the first to take wagons over this route. After seeing all of the debris strewn along the hillside it's not hard to imagine why they called this Fool's Hill. There are bits of wood from crates and broken pieces of glass and porcelain. Down in the gully are the remains of an early motor car. There are several sets of ruts that you can follow up the hill. It looks like the single track route that was probably used by foot and horse traffic went up the southwest side of the hill. It is easier to walk on but there isn't any broken glass and stuff to find. At the top of the hill the wagon road parallels a dirt road until it is almost to the north side of the hill where it crosses the road and continues downhill. It is easy enough to continue following the wagon road for a little further. There is less debris on this side of the hill but I did find broken pieces of an old bottle that I have seen ones similar to that date back to the 1800's. I set the pieces on a rock for future admirers. At the base of the north side of the hill the wagon road gets lost among two other roads that have been built since its time. The first road you come to was probably built next because it made use of non galvanized culverts. The culverts in the next road were galvanized so I'm guessing it was built and used before the present highway was built. If you do a little investigating near the top of the next hill about a mile or two away you can see where the wagon road crossed the current highway, descended the hill heading west, rounded the bottom and came up once again near the current road Highway 50. There is an old cairn like those mentioned in the trailhead kiosk on a hill a few hundred feet from Highway 50. More sections of the wagon road are also obvious in various places to the west of the highway for the rest of the way to Whitewater. Many of them cross private land though and can't be explored. If you are interested in the past history of roads and trails in the area then you will undoubtedly find the Salt Lake Wagon Road very interesting. You will hike a section of trail that was once crossed by the likes of Kit Carson, John Gunnison, Antoine Robidoux and John C. Fremont. As far as hiking goes though it is not much of a hike. It is posted here mostly for its historical value. It would be nice to see an improved trail developed on Fool's Hill to help preserve it for future generations. If you would like to see it for yourself then all you have to do is 'Take a hike'.